The DC metro housing market experienced a strong April, continuing its positive direction with increases in sales, new contracts, and inventories in all market segments. Prices had a just a slight increase from last year at this time but marked their highest April level since 2007. This is good news for both buyers and sellers who will find a more robust market and more confident Spring selling season than one year ago. With expectations so solid, it’s a good time to get off the sidelines to become a new homeowner or move on to a bigger or better home! Highest April prices since 2007, despite slowing of year-over-year gains. Inventories increased 22.5% to 10,867 active listings – with condos with the largest increase of 26.5%. This was the best April since 2010 with 4,268 closed sales. It was also the first time since October 2013 that all market segments – single-family detached homes, condos and townhomes – experienced year-over-year growth for 2 months in a row. New contracts have risen year-over-year for 6 consecutive months, and all market segments experienced an increase for the last 3 months. With 6,203 new contracts, April exceeded both the 5-year and 10-year average of 5,329. Townhomes increased 13.5%; single-family detached homes by 11.8%; and condos by 3%. With $2.1 billion in sales volume last month, April was a solid month despite just a 1.1% increase in year-over-year prices — $471,000 for single-family homes; $405,000 for townhomes; and $305,000 for condos. Condos lead the increase with a 1.7% bump. However, prices did jump 4.3% or $17,000 over last month. All jurisdictions showed increases in sales price except Alexandria City. 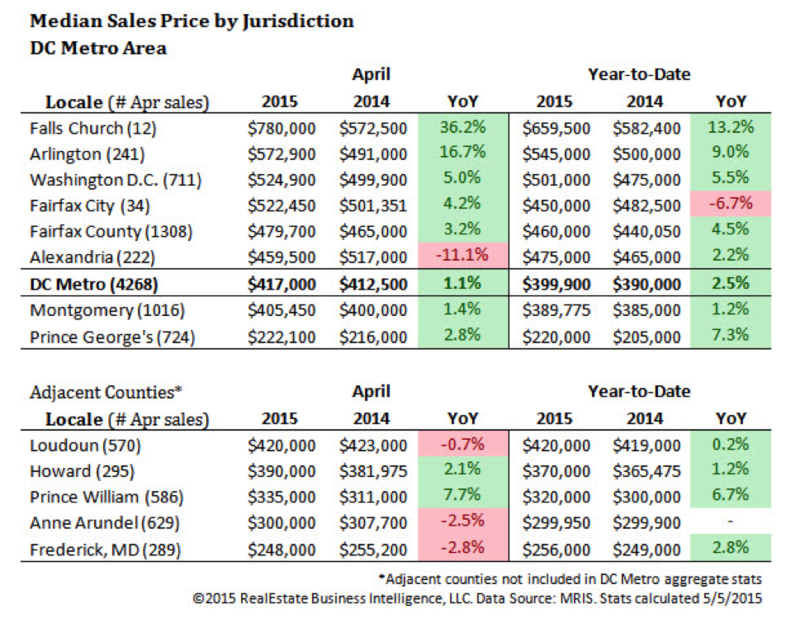 Arlington County and Falls Church City showed the strongest gain in price, 36.2% and 16.7% respectively. April’s inventories exceed the 5-year average of 10,611. Condo inventory growth took the lead with a 26.5% increase in active listings. Townhomes are up 24% and single-family detached up 20.1%. New listings reached its highest level in 60 months, and up 25.2% since last month. Townhomes have largest percentage at 20.7%. Median DOM remains 5 days lower than the 5-year April average of 19 days and 15 days lower than the 10-year average of 29 days. The DOM increased one day compared to April 2014. DC had the lowest DOM with 8 days, down from 10 days a year ago.